Demystifying both the darkness and hope surrounding childhood anxiety, Henry Winterbottom and the Feeling Rainbow is an illustrated adventure with real-world impact. 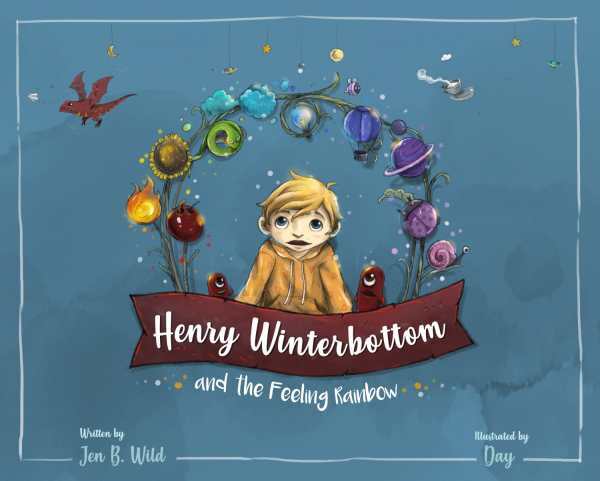 Henry Winterbottom and the Feeling Rainbow by Jen B. Wild is a beautiful, illustration-driven exploration of anxiety and mental health. Henry Winterbottom has a powerful imagination. He spends his days dreaming up fanciful worlds and expressing himself through colors. When the colors start to blend together, he can’t explain all the feelings in his head, so his mother guides him through coping with these unexplainable emotions. Early descriptions of Henry’s daydreams disappear from the story before long. Though the text guides the book’s illustrations, the emphasis is on the colorful and detailed images. Henry’s character is as eccentric as the artwork, and it’s through his visible expressions and imagination that he’s brought to life. Illustrations are sharp and tuned to complement Henry’s thoughts and feelings. Intentional color contrasts and focused light draw the emotions out of each illustration, making Henry’s feelings palpable. The hyperbolic artwork is both humorous and charming, contributing mirth to an otherwise dark topic. Henry is the only rounded-out character in the story. His mother is present only long enough to help him through his struggle; she has no personality of her own. While Henry seeks help from his teddy, it doesn’t have an active role, either. Real implications for readers come as Henry’s mother explains that anxiety is something that can be felt both by children and adults. An extended metaphor for inner turmoil, Henry’s story is told without external conflicts or substantial resolutions beyond his anxiety, though the book does end with Henry better understanding his feelings and how to cope with them. This parallels actual experiences of anxiety and the lingering nature of the condition, which can be understood and coped with if not erased.